If you could put on a pair of swimming goggles, shrink yourself down like a character from The Magic School Bus and take a deep dive inside a liquid, you would see a crowd of molecules all partying like it's 1999. All this frenetic wiggling makes it easy for molecules to rearrange themselves and for the liquid as a whole to change shape. But for supercooled liquids—liquids like honey that are cooled below their freezing point without crystallizing – the lower temperature slows down the dancing like Etta James' "At Last." Lower the temperature enough, and the slow-down can be so dramatic that it takes centuries or even millennia for the molecules to rearrange and the liquid to move. Scientists can't study processes that last longer than their careers. But Duke chemists and their Simons Foundation collaborators have found a way to cheat time, simulating the slow dance of deeply supercooled liquids. Along the way, they have found new physical properties of "aged" supercooled liquids and glasses. To understand just how slow deeply supercooled liquids move, consider the world's longest-running experiment, the University of Queensland's Pitch Drop Experiment. A single drop of pitch forms every eight to thirteen years—and this pitch is moving faster than deeply supercooled liquids. "Experimentally there is a limit to what you can observe, because even if you managed to do it over your entire career, that is still a maximum of 50 years," said Patrick Charbonneau, an associate professor of chemistry and physics at Duke. "For many people that was considered a hard glass ceiling, beyond which you couldn't study the behavior of supercooled liquids." This allows the team to explore new configurations that could take millennia to form naturally. These "deeply supercooled liquids and ultra-aged glasses" liquids are at a lower energy, and more stable, than any observed before. "We were cheating time in the sense that we didn't have to follow the dynamics of the system," Charbonneau said. "We were able to simulate deeply supercooled liquids well beyond is possible in experiments, and it opened up a lot of possibilities." Last summer, the team used this technique to discover a new phase transition in low-temperature glasses. They recently published two additional studies, one of which sheds light on the "Kauzmann paradox," a 70-year question about the entropy of supercooled liquids below the glass transition. The second explores the formation of vapor-deposited glasses, which have applications in drug delivery and protective coatings. 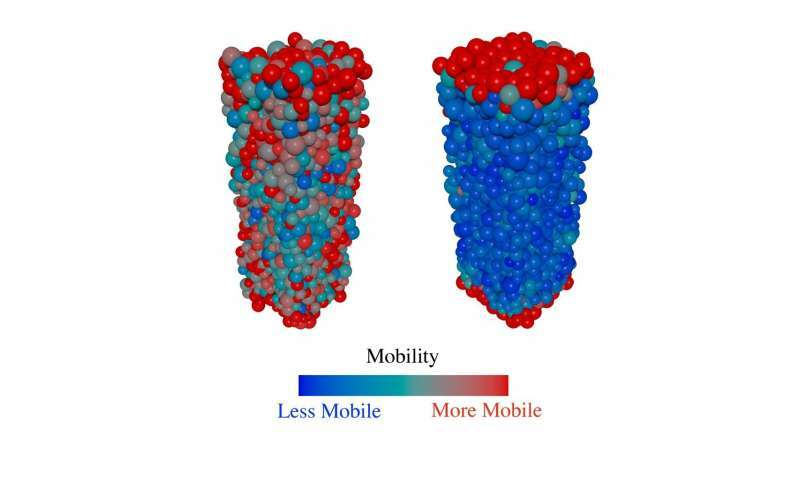 "Nature has only one way to equilibrate, by just following the molecular dynamics," said Sho Yaida, a postdoctoral fellow in Charbonneau's lab. "But the great thing about numerical simulations is you can tweak the algorithm to accelerate your experiment."